A couple of days ago, David Sumner, co-founder of RPGSmith got in touch with me and told me about his free web application. 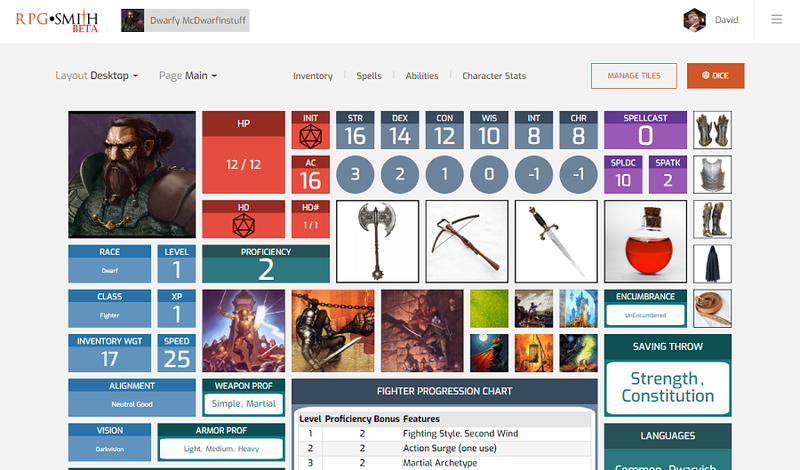 RPGSmith is – in a nutshell – an interactive character sheet with additional features like item, spell and ability management. The current application is meant for players, but they’ll be launching a Kickstarter later this week to fund an extended version of RPGSmith which will feature a GM campaign management interface. At the moment, the application supports the following rulesets: D&D 5th Edition, Savage Worlds Deluxe Explorers Edition, Call of Cthulhu 7th Edition, Fate Core, Fate Accelerated, and Pathfinder. It is possible to add your own rulesets though. From what I’ve seen so far RPGSmith could be a pretty nifty tool for players regardless whether they are playing online or offline. There is a bit of a learning curve though, but luckily the site provides users with quite a few tutorial videos. Having an interactive character sheet definitely comes in handy from time to time, and RPGSmith has support for desktop PCs and mobile devices, which is a plus in my book. You can even customize your character sheets to your hearts content. Will it change the way we play RPGs? I have my doubts, but it’s worth a look nevertheless. What are your thoughts on RPGSmith? Have you had the chance to try it out? Please share your comment below! It seems the folks at Modiphius are on a roll right now. Recently I shared news about their upcoming Fallout RPG and the new Achtung! Cthulhu edition for Call of Cthulhu 7th Edition. They also just released a huge number of miniatures and books for their new John Carter line. So it’s probably no surprise that I put the news about a new setting for Paizo’s Starfinder to the side for a while. This upcoming setting is called Grimmerspace and will be co-written by none other than Sean Astin of Lord of the Rings and Stranger Things fame. I was actually quite surprised when I read this bit of info in the official press release since I didn’t know Astin was a roleplaying game fan. The game will be designed by Iron GM Games (Lou Agresta and Rone Barton), and Modiphius will act as a worldwide distributor. Fitting the theme of Starfinder, Glimmerspace will be a science-fantasy setting in which high technology and magic coexist. Personally I am not that interested in Starfinder-related stuff, but I still thought this news might be of interest to some of you. If you are looking for more information on Grimmerspace and the upcoming Kickstarter to fund it, check out their official website. A friend of mine just pointed a pretty good deal out to me. In order to celebrate Pathfinder 10th anniversary, Humble Bundle is selling $505 worth of Pathfinder stuff for mere $18. The offer is tiered with the lowest tier starting at $1 and containing the Pathfinder Beginner Box, the core rules, several sourcebooks and trial access to Pathfinder Online. The next tier starts at $8 and contains additional material like the Advanced Player’s Guide and the Villain Codex. The third tier starts at $15 and contains books like the Ultimate series of sourcebooks, Bestiary 2 and 3. Last but not least the highest tier starts at $18 and contains more material for Pathfinder, and also the core rules for Starfinder, Paizo’s new Science-Fantasy RPG. Of course you can always decide to pay more. Each Humble Bundle sold supports charity. You can either choose the one featured by Humble Bundle this month, or choose your own.